We are delighted to announce the launch of our author Jane Charlotte’s new novella, Captive Moon. Set in 1891 Edinburgh, Captive Moon is a story of duty, love and betrayal, with a magical twist. Sarah Snow seems just like every other demure young Victorian woman, but she hides a terrible secret. She has the power to resurrect her foolish brother Barty every time he dies. Sarah has given up hope of love and freedom, and her future looks like it holds nothing more than a cycle of restoring Barty to life. When Barty wakes and finds himself with rotting flesh which Sarah’s magic cannot fix, she resolves to find a cure. Her quest leads her on to the path of the charismatic Elijah Swift, makes her question her dedication to family, and draws her towards the mysterious Amulet of Hecate. Over the next two months Captive Moon will be released as a twice-weekly serial on the popular site Wattpad. Wattpad has over 35 million users, a figure that’s growing every day. It has captured readers around the world – at least 80% of the site’s users are thought to be readers, not writer/readers – as it offers them free, accessible stories to consume. There are some incredibly popular authors showcasing their works on the site, from Margaret Atwood to Hugh Howey. One of the best things about Wattpad is that it’s really a social network designed around books and stories, which gives readers the chance to interact with authors. If you’re not on there already then sign up for free and read online or on your tablet or phone. We’ve chosen Wattpad as our launch platform as we want to connect with you, the readers, and to hear what you think of Jane’s book. 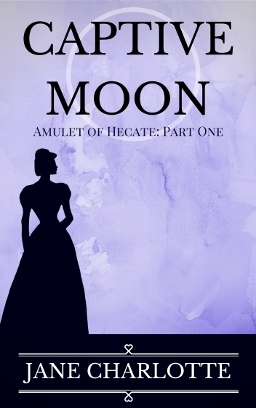 Connect with Jane Charlotte on Wattpad, and look out for new updates to Captive Moon on Wednesdays and Fridays. We’d love to see you there.